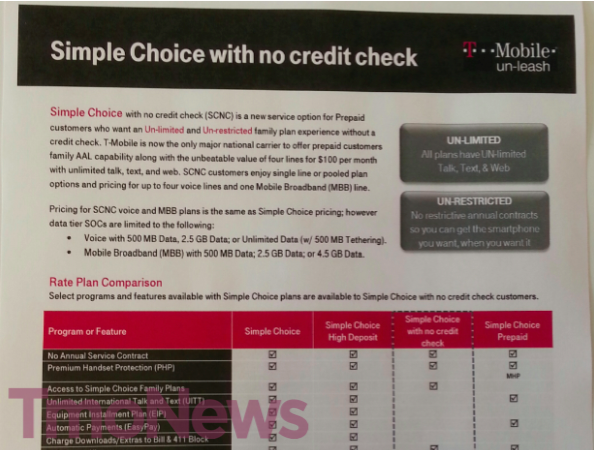 Just as we suspected, T-Mobile is introducing a Simple Choice with no credit check to help customers with “less-than-premium credit.” Beginning on July 14th, families can get four Simple Choice lines with unlimited talk, text and web and up to 500MB of high-speed data for $100 per month. According to T-Mobile, one in three consumers who apply for wireless service do not have a credit score that allows them to qualify for the best wireless rates. T-Mobile wants to make that concern a thing of the past with the introduction of this new plan. Want to know more? We ran down the entire plan late last month! You can find all the details here. Can 20 more for each line make it unlimited with this plan? the plan is already unlimited talk text and web its just that you only get 500mb of high speed web. Yes you can upgrade the internet to truly unlimited so it never slows down. So its just for families? nope friends can use it too..
You are still tied to a contract for the DEVICE! You will be asked to pay for the full amount owed on the device. If you do not make the credit check for the EIP then you have to pay full price for the phone. There is no way of “skipping out with the phone and not paying”. Financing is not offered for prepaid plans. There is no device “contract”. Oh, well It sounded like salesdiva was stating that you did not have to pay for the device and could skip out on the bill and take the phone. That’s what I responded like that. I cant believe no one asked no one asked about the edge only areas. But arnt alot of these areas just roaming with att and not actual towers? Is $100 all-in (taxes and fees included)? Otherwise, eh. about $100 will be your down payment. It’s about the same as going through a credit check. $100 for 4 lines PLUS taxes & fees. Why do you say “eh”? That’s $25 per line, which is pretty damn cheap. Too bad my family is 5 or else this would be great. I guess our grandfathered plan remains better as some need more data. I thought I read somewhere that you can get a fifth line for ten more dollars a month? Is tethering included as well?